Donatello finds himself floating in a white void, but soon discovers a “floor” and spots the Sons of Silence seated around the Turnstone. Don is puzzled, as he thought that Cherubae had wished the Turnstone and the Sons out of existence way back in issue #13. The Turtle then ponders where he is, and what the Sons of Silence are up to – so he decides to ask them. Don walks up and taps one on the shoulder, and the group turns on him. They communicate telepathically, asking the mutant if he is afraid. Don states that he’s not afraid, and one of the Sons touches his face. Don protests, but then admits that he feels much better afterwards. Donatello is then questioned if he’s ever thought about his destiny, and the Turtle replies that he hasn’t, as he’s always believed that we were masters of our own Fate. Don then asks why the Sons are asking him this question, and they tell him that they’re not. Confused, Donatello states that there’s no one else there – when he’s surprised by the Turnstone telling him that he’s wrong. 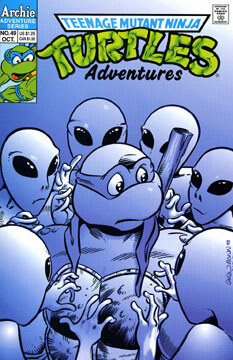 Back on Stump Asteroid, Leonardo discovers that Don is missing. Before they can search for their brother, the Turtles are taken to a large conference room, where all of the local aliens try to decide what to do about the growing danger of the Black Hole and Emperor Mazool. Trap explains that the planets closest to the Hole must be evacuated, and how Mazool has taken advantage of the chaos the Black Hole is creating by attacking everyone with his Aerwyl Imperial Fleet in effort to take control of Dimension X. Trap tells Nova Posse that they’ll have remove the threat that Mazool poses while the others rescue those in peril. The Turtles state that they want to help, and Trap tells them to assist Nova Posse. Everyone heads out to their ships. The Nova Posse’s ship appraoches the planetary home of Emperor Mazool. The team manages to break into the Imperial Palace, but they find Mazool waiting for them with a brigade of soldiers. As Mazool explains that all of their efforts are futile, the Black Hole suddenly doubles in size, and begins to pull everything into it! Back in the void, Donatello is holding the Turnstone, his eyes are blank, but a huge grin is plastered on his face.